Ok.. well since I have had countless requests.. 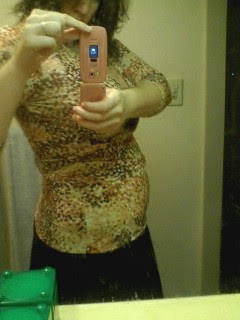 I am finally onbliging the masses with a (pathetic) bump picture. Really I just look like I’ve gotten chubby – but I’m only about 16 weeks and I’ve been told that first timers like me don’t pop out too much until the end of the 2nd trimester. It’s Friday but I have a half day of work tomorrow 😦 Uggggggg its so cold I just want to stay in doors and sleep. Also on the subject of my “bump” it currently looks much more like a muffin top than anything else. AARRGG?!!? Anyone get my catchy yet punny title? Ok maybe its not so funny. Today was my 4 month check up! Things look good! (Yay!) All my cheese eating seems to have payed off as the little one has a nice and very visable spinal cord! He/she was also pumping his/her fist for us. Looks like we have a partier on our hands. It was our first time to see something besides the babies heart moving so it was pretty cool! We could make a little bit of the face and it looks like the baby may have a similar chin bone structure to me. 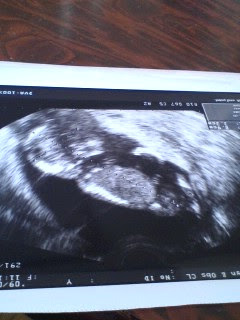 Not sure yet, but thats what it seemed on the ultrasound. Also found out my blood type (A if you were wondering) which is pretty boring in itself but cool in the fact that Ryohei is B/O and I am A/O so we could have an A, B, O or AB kid apparently! So looking forward to seeing what it will end up being! Anyways thats all for now! My pink/blue poll is closing in a couple days so if you haven’t cast your vote do it now! Like the majority of poll votes we are both leaning towards the baby being a girl. It just looks/feels like a girl to me… hopefully we will get some sort of prediction either way at the next appointment in Feb. Living as an expat, there are certain things that can absolutely delight you. Little discoveries and perks from your “past” in your home country that show up unexpectedly and provide a little glimmer of happiness on a gloomy day. One of the nice perks of living in Kobe is accessibility to several foreign goods shops within walking distance of my work. I’ve found since becoming pregnant that more than ever before I have wanted foreign foods, particularly those that I ate regularly when I lived back in America. The other day I found some random Kraft Mac&Cheese at the local Khaldi Coffee and enjoyed it so much. I went back to look for some more today and it seems the two boxes I grabbed must have been the last in stock because there weren’t anymore. Wahh… that was such a bummer. As I mentioned last time I am totally craving cheese and cheese-y things. Oh well… I will check next week as well. On my way back I noticed yet another foreign goods store, one that I usually don’t go to. Anyways feeling disappointed from my earlier failure I went in to take a look and no Mac&Cheese but YES Pepperidge Farm MINT Milanos!! 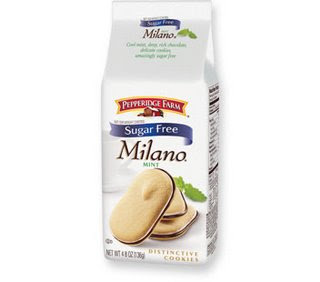 I’ve seen random Pepperidge Farm brand cookies in Japan but never ever Mint Milanos which I could have lived off of in University. A price check showed they were about 375 yen… which is expensive considering they are less than 3 dollars in America, BUT of course I made the purchase. I am so looking forward to my tall glass of milk and Mint Milanos this evening!! BTW – I’m thinking that Pepperidge farm cookies may be only an American brand But if you non-American gals ever see them I highly, highly recommend them if you like mint and chocolate. They are so yummy and definitely an “adult” cookie to stash away for yourself and not give the kids. Anyways now that I’ve gushed about food for most of this entry… (you would never guess I “cometed” a whole bunch of bile before I went to work, thanks lingering morning sickness…) I have even more news to share! I hopefully will be an Auntie as well as a Mommy this year!! I’m not sure I mentioned it but Ryohei’s little brother is getting married this spring and Ryohei neglected in telling me his wife to be is also pregnant! So that means our little jellybean may have a cousin very close to his/her age! I don’t know how far along she is, but I think maybe only 4-6 weeks behind me… however apparently there were some early complications so neither Ryohei or I know how the status of things are right now. Anyways that’s all for today, sorry for all the boring food and pregnancy talk… just another hour and a half until my date with the cookies awaits!! Hmm… it seems that my writers block is back. Well we had a good run of… um 2 weeks or so of frequent posting. It seems like work and my cold have squashed out all of my creative juices. Also doesn’t really help that once again nothing is going on. We bought a heater (late, I know) since I thought we could last the winter without one but Ryohei couldn’t cut it I guess. Anyways it’s a panel heater and apparently its one that’s safe to use with kids around and low cost (uses electricity not oil or gas) so I guess it’s a worthy investment – it hasn’t arrived yet but now that it is coming I am really looking forward to it since mornings are absolutely horrible. Something about waking up in a warm bed in a cold room that makes you NOT want to get up right? I came out to the people at work about my “condition.” I did it at our New Years Drinking Party and waited until everyone was good and drunk to bring it up that I was expecting and because of that would be leaving work early. Anyways no one has brought it up too much which is nice. I’d rather not have a big deal made out of it at work. I think it helps that I’m not really showing and that no one really had a clue. Currently less than 6 weeks until I am in warm and sunny Southern California with my beloved fish tacos, kitty cat, and shopping malls with clothes that don’t make me cry every time I try something on. So that’s my ryokan story. I’d give it a 80 point rating I guess! I was expecting to make a nice post about the onsen trip that Ryo and I took last weekend but instead I had an absolutely horrible day yesterday so I will post about that instead. Lucky readers! Lets add to this the fact I caught I cold over the weekend. So I had a horrible headache, stuffy nose, and sore throat as well (and you can imagine what my three times to the porcelin throne did to help my throat out) Anyways Ryohei to the rescue I guess. He was going to play soccer with his work buddies but changed his mind when the plastic bag was called into action so I did get a bit… babied last night. Which was nice. He bought me a huge bottle of pocari sweat… his cure it all remedy drink which I was able to keep down!!! (yay!!) And he made me mashed potatoes which I also kept down yay! My first nutrients of the day. Anyways when I woke up this morning I knew I was not going into work. Of course they made a stupid rule that whenever I want to take a sick day I have to get a doctors note and obviously even if I went to a doctors theres nothing I can do… its not like they can give me medicine or anything. So I’m taking one of my vacation days instead. Whatever… I think its so stupid to drag yourself out of bed when you are sick to go to the doctors who is just going to give you some pills and go back to bed. So yah… sorry for all the negativity. I was 13 weeks pregnant Monday and told that was the magic number for 1st trimester symptoms going away. I guess not so much. And I should try and eat something now because its past noon but I really don’t want to throw up again so I haven’t had anything besides pocari sweat. I have to admit at one point yesterday I was thinking “I don’t really like you very much” to the baby. *sigh* Yes I know… I’m horrible. I’d say call the services but I don’t think they have them in Japan… or at least use them much. Another post – sorry if its boring! The last couple weeks I lost my “voice” but it seems back with avengence in the new year. So what is new.. not much since my last post. Except the countdown until our trip is now only 2 sleeps away! I am still really looking forward to it, especially as it may SNOW up in that area during the day we are there! As long as I am in a comfy room with a warm futon thats fine with me!! Actually got quite a bit done on the baby front in the last few days. I “reserved” the place where I will give birth. I have to make sure and visit them before I am 34 weeks but I should be in Niigata well before that time so its not a concern. We also got my boshi techo (mother and child handbook) which will track all sorts of fun pregnancy things… like my weight. I also got 5 free visit coupons but they can only be used while in Kobe so I guess I’ll just have to use them all up before I leave… I probably only have 4-5 visits left while I’m here actually since the doctor I’m seeing now only has me come in once a month. So now that I’m pretty much out of the the miscarriage risk zone there are lots of things on my mind! Mainly I am soooo curious to know whether we are having a mini-sarah or mini-ryohei! We already have our first names picked out either way so I’m ready to graduate from calling the baby a jellybean to its actually name… somehow that makes it more real. I’m really really hoping the doctor will tell us before I go back to America in early March. I’ll be around 20 weeks then so maybe they will be able to? Is 20 weeks about when they will tell you the gender in Japan? Ahhhh… I am so impatient!! And once I can find out I can start getting pink or blue!! I’ve been really good and not bought anything for the baby yet… besides a really cute sippy cup and the Totoro blanket I got when I was visiting Nay. One more day til the 3 day weekend!